For most ‘bricks and mortar’ businesses getting yourself noticed is essential, and standing out in the crowd has never been more important than in today’s challenging market place where every sale and new customer counts. At the store-front a free-standing Pavement Sign or A-Board does a great job to attract a customer’s attention below head height but visibility can get obscured by other pedestrians and street furniture, particularly from longer distances. A solution is to invest in complimentary higher level signage. Signwaves offers a range of Projecting Signs and Flags that cater to various business needs and promotional requirements. From wall mounted Flange Signs or Display Flag Kits, to free-standing prominent Flying Banners, there is something to fit most situations. 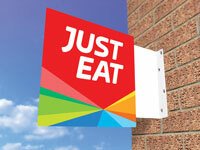 As a permanent fixture one of Signwaves wall-mounted projecting sign solutions is the answer. Exceptionally popular with the food and drink industry, retailers, financial sector, automotive and hair and beauty salons, the low cost Flange Sign offers endless make-to-order customisable shape solutions in addition to the three standard stock options. Signwaves is happy to offer customers free creative input when it comes to marrying branding with shape and structural integrity for the optimum stand-out signage solution. For those looking for advertising flags that attract attention through movement, but are space restricted, then wall or window mountable Display Flags could be the answer. Signwaves Sucker Flag and Noscrewz Flag Kit incorporate powerful suction bases that are designed for quick attachment and release to glass without the need for tools, opening up significant opportunities for store front promotion, particularly where wall space is at a premium. Taking just seconds to mount or detach they are designed to be taken in when the business is closed to extend working life and to avoid theft. 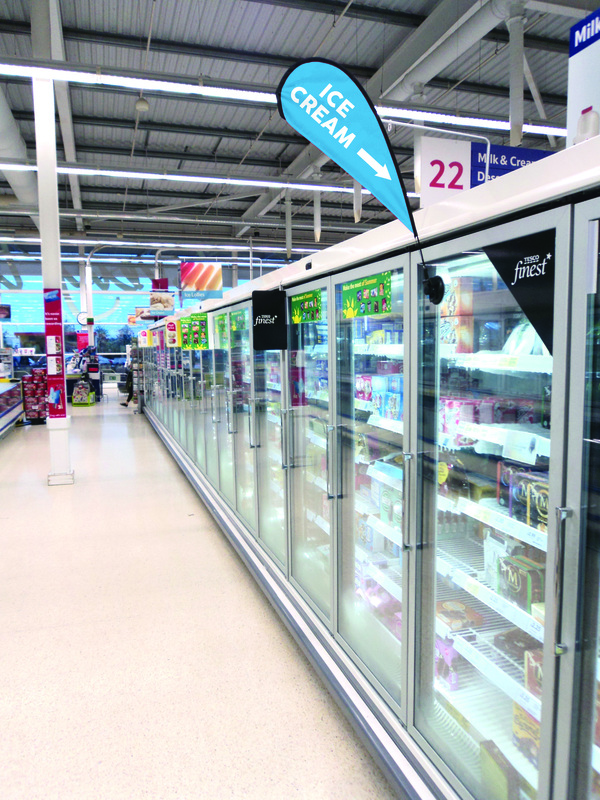 The suction bases can be used on any smooth flat surface indoors or out, such as vehicle windows, in-store shelving, chillers and cabinets, making these simple to install fixing free displays a winner with retailers and brands alike. Free-standing pole mounted flags are another option for high level visibility and have become extremely popular outside retail premises in recent years – by petrol, automotive and out of town retail in particular. With their roots in the outdoor events market Flying Banners have become a common sight on our high streets, at service stations, leisure venues, fast food outlets, beach fronts and even in-doors at exhibitions and shopping centres. Part of a growing trend for ‘soft signage’ Flying Banners are available from Signwaves in Feather, Teardrop and Rectangular styles, each in 3 sizes standing up to 5m in height. The highest quality printed textile flags are supported on industry leading carbon fibre poles and friction free bearing spindle on a choice of base, spike or bracket mounting.